Summary: Mango Languages is a pretty good resource with numerous languages available along with their regional variations. It’ll work the best for beginners or for those interested in studying a few languages at the same time. Anybody past the intermediate level won’t find Mango Languages very useful. It is well designed, has a beautiful interface, and is intuitive to use. There are some gaps in terms of writing and grammar, along with a lack of materials for intermediate or higher level students. The price is fair and will give you access to materials for over 70 languages. It’s very easy to use and has a slick design. The intense drilling of useful real life sentences and words during lessons will really help you remember them. Cultural and grammar notes incorporated in the lessons are well-prepared to help you understand the language you’re learning better. The subscription gives you access to over 70 languages. Most courses finish around the intermediate level with some less popular languages ending before that. There’s not enough grammar practice. During drilling, when a student is prompted to complete a task such as coming up with an appropriate translation of a sentence, the command is read out loud. Listening to someone repeat very similar commands over and over again is tedious. The Google Translate plugin is a rather lazy and disappointing way to give students answers about words or sentences they’d like to translate. Price: A subscription to Mango Languages costs $19.99 per month or $199.99 per year. 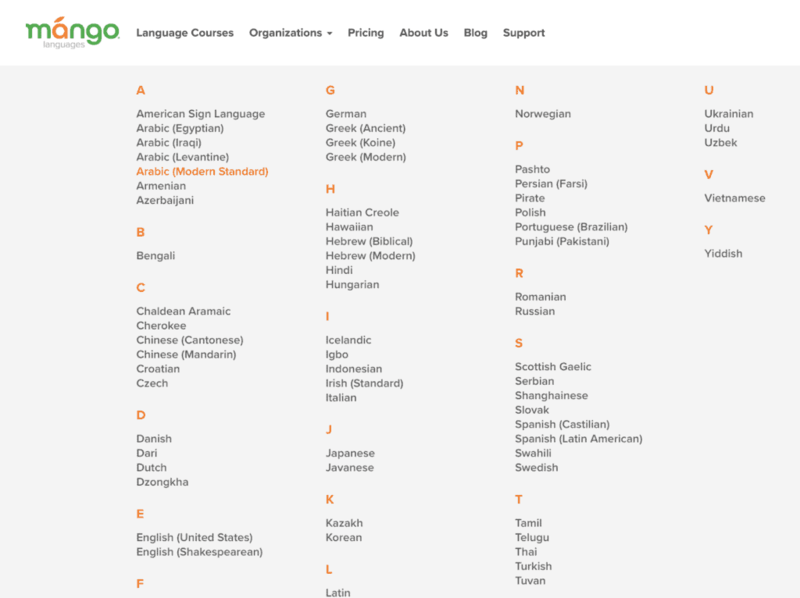 Alternatives: Babbel is a somewhat similar course that’s a bit cheaper. The best alternative will likely depend on the language that you’re learning. Take some time to look through some of our reviews for courses in the language you’re learning. Mango Languages has high-quality beginner to intermediate level lessons in tons of different languages. That’s not an exaggeration. Seriously. You can even learn Pirate or Shakespearean English. More practically, the fact that there are different courses for French and French (Canadian) may better highlight the options you have to choose from. 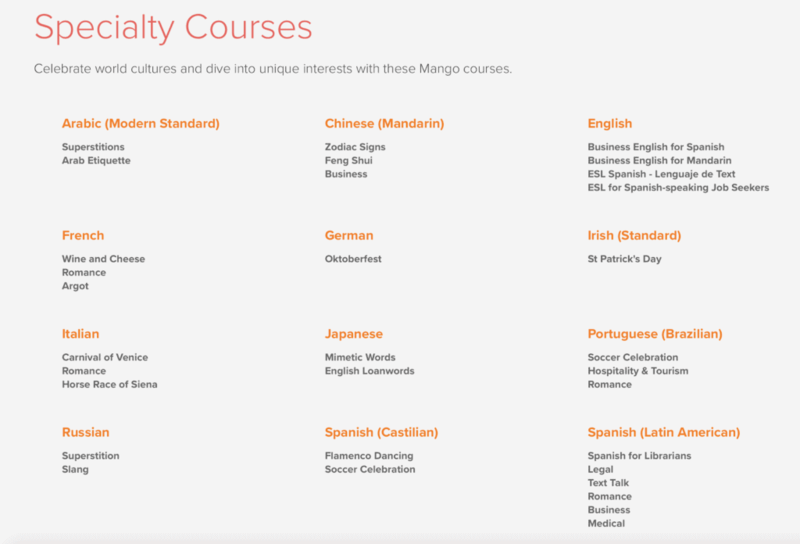 Unlike some resources, if you subscribe to Mango Languages, you’ll be able to use it to study any of the languages available on their platform. Having access to all of these languages and differentiated courses depending on their region is a major benefit, but that alone isn’t enough of a reason to subscribe. Let’s take a look at how Mango Languages actually works and see if it’s worth using. The resource offers a lot of drilling to prepare you to start speaking fast in a natural environment. The phrases students learn are natural and not overly scripted. Even more importantly, the courses are customised depending on the language to teach it better. For instance, the Spanish course because of the importance of formal and informal forms in the language offers a lot of the drilling exercises focused on this particular feature of the language. You can expect to gain confidence in your conversation skills with Mango Languages and to learn grammar in practice. However, it won’t be of much use for more advanced students or for people for whom writing skills are crucial. Mango Languages has a very simple structure. The courses are divided in units, units in chapters and chapters in lessons. The amount of content available for popular languages is overwhelming. You may expect to be well prepared for fairly complex conversations about everyday topics after you’re done with the course. To get access to the platform you need to create a free profile or sign up for a free 2-week trial before your subscription starts. A part of the profile creation is choosing the language you want to learn. This doesn’t mean that you won’t have access to other languages later. It just let’s the program know to what learning pathway it should take you to initially. There are no limitations when it comes to exploring the platform. You can choose the topics you’re interested in by reading the chapter’s description. However, this is only a good idea for students who already know at least a bit of the language they’re learning. Lessons build upon themselves and assume you understand the content of the topics that have been learnt in previous lessons. As an absolute beginner, you’re likely to get confused if you jump ahead and don’t follow the lesson order. This screen contains even more specific descriptions of what you may expect to learn in the unit. The green ticks you can see, mean that the lessons have been completed. The platform tracks your progress. Clicking on a lesson card will take you to your lesson, where yet again you’ll be informed what you’re going to learn first with a general overview, then in a dialogue, which the lesson will help you master. You can also click on the keyboard image to display the keyboard guide. This list of shortcuts is quite useful for working with the tool so try to check it out. On each screen, an English speaking voice will teach you something or prompt you to perform certain tasks. All screens have similar options. To practice the pronunciation of a word and compare the way you pronounce it to the recording, you should click the orange button with a microphone on it. The green button with a speaker on it will play the word again in the language you’re learning. If you hover over it or over the word itself, you’re going to see a simplified phonetic spelling to help you pronounce it. You can also listen again to the English speaking prompt and explanation along with the pronunciation of the word by clicking on the blue replay button. When you’re done with a screen, you need to either move an arrow to get to the next screen or click the arrow on the screen. Sometimes you’re going to be introduced to a series of words one after another and sometimes a word requires an explanation. This is when the program will display a grammar or a cultural note on the next screen. This is a very useful feature of Mango Languages, which allows you to understand the language which you’re learning better. They’re also short and sweet without overburdening you with too much information that you’ll never use. After you’re introduced to a number of words, you get a screen with a voice prompt asking you “How do you say X?” with a timer. You’re supposed to guess the answer before the time runs out. If you don’t manage, the answer will be displayed on the screen and pronounced. If you’re ready ahead of time to check whether you’re right, click “Show answer”. It’s a really cool exercise that forces you to learn to think quickly and prepares you for real-life conversations. Thinking half an hour about how to say “Good morning” won’t get you far with a native speaker, after all. As you continue with the lesson the exercises get more complex. You’re not prompted to say singular words over and over again but rather to build phrases with them. As before you can hover over the words in your language to see the phonetic spelling. A lot of students comment on certain expressions as “not making sense”, which usually means they’re counterintuitive for them. This option is a good way to allow learners to understand the logic behind a phrase and remember it better. After you’re done with all lessons in a chapter, a chapter review and a chapter quiz await you. Both of them are quite a good way to practice what you’ve learnt, even if Mango Languages would really benefit from some more grammar practice. The lessons are interactive and quite entertaining to use but they can feel a bit repetitive over time. Part of the problem is that the instructions and prompts are read to the user. When I did a few lessons during one study session I felt tired from listening to similar content over and over again. Having said that, a part of the tool’s didactic effectiveness is its repetitiveness. I remembered words and phrases much better than with any other tool I tested before. This is because Mango Languages encourages you to think. It doesn’t ask you to repeat one word over and over again like other platforms but moves on to linking words together first into simple and then more complex sentences. The color coding really helps in understanding the structure of sentences in the language you’re learning. Apart from lessons and verification of your knowledge, there are some tools that you can use to improve your language skills. You’ll find them just next to your normal Pathway on the menu. Your options will depend on the language you’re trying to learn. The first tool is a rather disappointing Google Translate plugin with a disclaimer warning you about its limitations. Unfortunately, machine translations are far behind human translations in terms of quality. One of the problems is word by word translation rather than the translation of the sense of the given phrase. Another serious issue is the lack of capacity to consider the context. The tool is somewhat reliable for words, certainly more than for phrases and sentences. Still, sometimes you may not get what you’re truly looking for and end up saying something odd or funny in a conversation or in correspondence. The word “sincerely” in English can be used for both the final line in a letter and as a synonym of the word “honestly”. The tool translates “sincerely” into Polish as “z poważaniem”, which can only be used in correspondence to sign off. A much more reliable tool to use to find an appropriate word or a phrase is a free online dictionary, Wordreference. It’ll give you a number of answers to your query with the context in which you should use it and access to a forum when usually someone has asked a question before. Some languages in Mango Languages offer movies, which is a really nice way of interactive learning. The functionality is limited at the moment as for example, there are only two movies available for the French language. However, it has great potential. Perhaps this could eventually replace resources like FluentU and Yabla. Another supplementary tool is Mango Reader. It’s a Chrome plugin that allows you to get translations of words on any foreign language website you visit. It’s aimed at intermediate students as a way of expanding their vocabulary and improving their reading comprehension. A nice part of this functionality is the option of adding the word you’ve looked up to your vocabulary bank. You can also see a translation of a whole chunk of text via Google Translate. Seeing that it’ll give you the gist of the meaning (prepare for some funny sounding expressions), it can actually be useful for this purpose. While Mango Reader is useful, I’m not sure if there’s any benefit to using it over Readlang or Dictionarist. Last but not least, there’s Mango Vocab. It’s meant to provide you with additional vocabulary practice. You can also choose in which way you’d like to practice your vocabulary, depending on whether you like to be quizzed or not. With this tool, you can use pre-created Mango vocabulary decks or prepare your own study material. You can also personalise your learning experience by choosing your goals. Mango Languages will track your work and you’ll be able to see your weekly stats. The exercises in the quizzes are quite simple and can feel repetitive. This part of the platform could use some improvements and should be supplemented with grammar exercises. All in all, Mango Languages has a lot of potential and is a good tool for beginners and aspiring intermediate students. 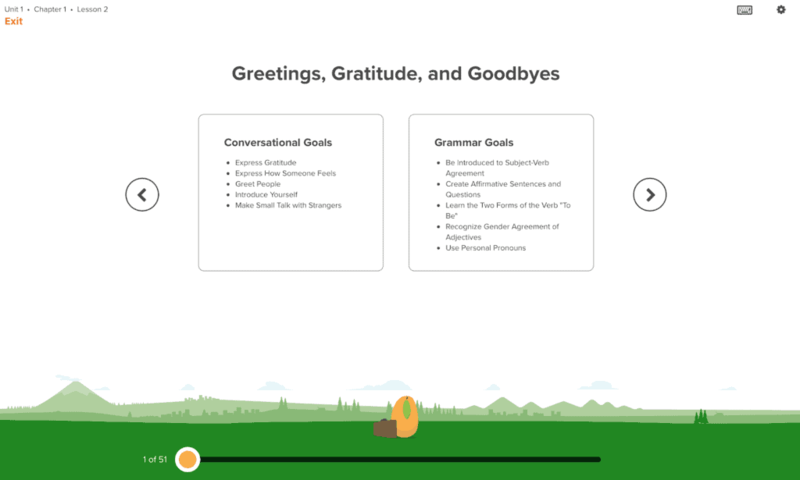 Apart from the movies and the vocabulary plugin, unfortunately, it doesn’t offer much for more experienced language learners. Mango Languages offers one standard subscription plan for individuals at 19,99 USD per month. You can also decide to save the equivalent of a two-month subscription fee by paying for year-long access. For popular languages, Mango provides solid value for the cost. Seeing that the scope of the courses really differs, I suggest you check what the platform offers for the language or languages of interest. You can get a free account on Mango Languages which will give you limited access to the content. If you give them your credit card details, you get a two week long trial with a full experience. You can cancel your subscription at any time but if you want to avoid getting charged you need to cancel it before the two weeks pass. I really enjoyed using Mango Languages. I thought that the tool was really good for learning how to speak fast and with confidence. I like that the drilling during the lessons forces you to actively practice what you’re learning. The cultural and grammar notes are helpful and informative. Apart from the lessons, I find the additional tools, to be helpful, though not particularly unique or to be a reason to subscribe. Like with most resources, some of the practice is repetitive and can get a bit boring after awhile. One big room for improvement is that there are no grammar exercises apart from drilling during the lessons. There’s also only so much you can learn on Mango Languages, even with the more popular languages. Unfortunately, the courses stop around the intermediate level and leave you needing to look elsewhere once you’ve moved past the elementary stage. You can try out a free 2-week trial to Mango Languages and see if the teaching style is a good fit for you.